Kellogg Professor Daniel F. Spulber's latest book aims to fill a gaping hole in economics that has saddled the profession with a 100-year-old playbook during one of the worst economic crises of our time. "In the press and in politics, we are facing this huge debate over what should be done about the recession and how we should deal with it," says Spulber, the Elinor Hobbs Distinguished Professor of International Business and Professor of Management Strategy. "If you listen carefully, you may be surprised to discover we're all using a playbook that's nearly 100 years old — one that dates back to the Great Depression." Indeed, many economics textbooks omit the concept of entrepreneurship. "Textbooks are completely devoid of the concept of entrepreneurship, when people are saying the engine of new job creation is the new business and the small business," Spulber says. "If we don't understand what entrepreneurs do, we may be making serious mistakes going forward in terms of what the government will do to turn around the economy." Entrepreneurs play a key role in creating firms, and are responsible for much of this country's innovations — new products, new product techniques, new ways of doing things. Without entrepreneurs, Spulber notes, no firms would exist. "Firms do all of the heavy lifting in our society," Spulber says. "They are the mechanisms that carry out construction, transportation, manufacturing, communications, our financial system and retail and wholesale industries." 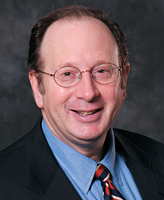 Spulber aims to update the debate as well as his peers' and advanced students' understanding of economics with his admittedly "big book," The Theory of the Firm: Microeconomics with Endogenous Entrepreneurs, Firms, Markets, and Organizations (Cambridge University Press, 2008). The book is Spulber's 11th, but he says it means "a lot" because it represents the culmination of his thoughts on such a critical issue. Spulber believes a better understanding of the roles of entrepreneurs and companies would give policymakers pause before bailing out failing businesses. "The capitalist system means some entrepreneurs will fail. We have to avoid penalizing the most successful, and we have to be careful not to try to rescue the failures," he says. "Unless we have a true roadmap, we may make a terrible mistake as we go through these troubled times." And those hard times aren't all bad, Spulber says, pointing to the innovations that emerged in spite of the dot-com bust. "Every business is now using the Internet," he says. "It's bringing great efficiencies." 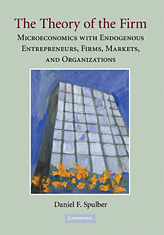 The book has drawn advance praise from business practitioners and fellow academics alike. "Daniel Spulber has produced nothing less than a magisterial work," says Carl J. Schramm, president and CEO of the Ewing Marion Kauffman Foundation. Schramm expects that introductory texts in economics "will have to be rewritten to accommodate the importance of his work and insight." Spulber's long-term goal is to spark debate over today's government policies so that the far-reaching implications are better understood. He is concerned that entrepreneurial growth may slow down when governments follow the Keynesian prescription of big deficit spending. "If government mops up credit, it causes a phenomenon called 'crowding out' and that makes it difficult for would-be entrepreneurs to get credit," Spulber says. "If I want to start a corner grocery or the next General Motors and I cannot get credit, what a loss that would be. "We have to be careful if we want to stimulate economic growth," he adds. "We should allow entrepreneurial competition rather than the government to pick winners."